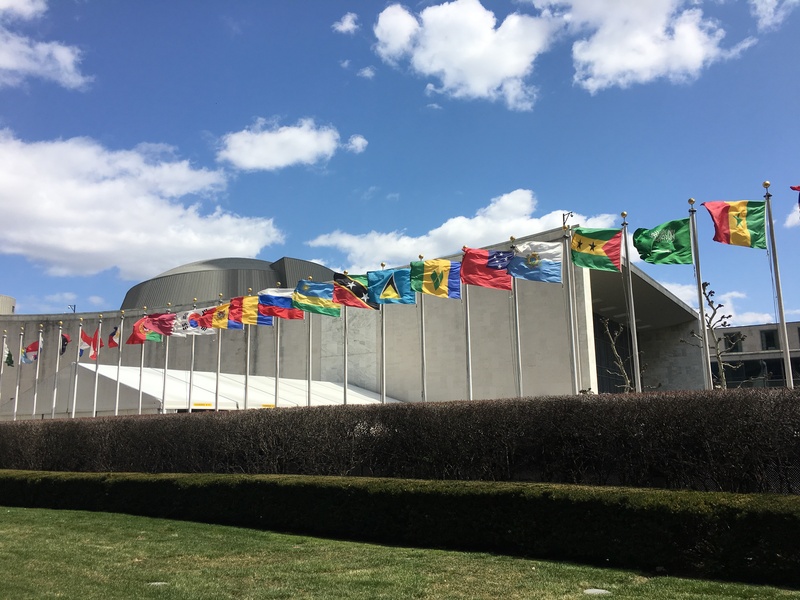 Stunning blue skies, vertiginous skyscrapers and a vibrant array of national flags greeted me upon arrival at the UN headquarters in New York, where I travelled for the Committee on the Status of Women (CSW) in March 2019. CSW is a UN body but also an annual global gathering focused on gender equality and women’s rights. It brings together feminists, activists, survivors, women’s organisations, NGOs – a rich and diverse sisterhood working to promote gender equality, advocate for women’s rights, highlight intersectional struggles, combat gender-based violence and bring down the patriarchy. On the first day of CSW at the NGO briefing I heard from the Lopa Banerjee, Head of Civil Society Engagement at UN Women who emphasised that despite the challenges to civil society – funding being chief among them – that 9,000 individuals had registered for CSW in 2019; record number. No doubt fuelled by the continued injustices women face; economic, social, environmental; and the outdated gender norms which enforce control over our bodies, sexuality and minds. I set off with a packed agenda of official panels, side events, partner meetings and networking opportunities I would be attending to advance Orchid Project’s mission to end female genital cutting (FGC), and was raring to go! And then I saw a film about Ndèye. 13-year old Ndèye Fatou Fall is a filmmaker. She also happens to be born in a community in Senegal – Keur Simbara – where a communal decision has been taken not to cut their daughters or marry them under the age of 18. A long-term, holistic, human rights programme was conducted in Ndèye’s community by Tostan, one of Orchid Project’s partners, to enable the community to explore, debate and identify their vision of the future they wanted to secure for their children. In turn, they are contributing to the global effort to end FGC. Ndèye’s story gives us hope and faith that change is happening. I went on to meet various actors within this global movement for change: governments like Burkina Faso (who are African Union champions on the issue) and the UK (who have pledged a historic £50 million to help end FGC); survivors and activists like Ifrah Ahmed; UN agencies such as UNICEF, UNFPA and UN Women running key progammes globally; fellow civil society actors like the newly formed End FGM/C US Network and COVAW one of our partners in Kenya. Ndèye Fatou Fall, Keur Simbara. Credit: Tostan. I heard strong words from governments such as the Gambia, Egypt, Indonesia and the US about their focus on ending FGC, in some cases through approaches based on social norms, in others through legislation or communications campaigns. We heard about data on progress in reducing the numbers of women and girls subjected to FGC and commitments to uphold key instruments and commitments such as the Sustainable Development Goals (SDGs), the Maputo Protocol, the Istanbul Convention, and the Convention on the Elimination of all Forms of Discrimination against Women (CEDAW). What is abundantly clear is that that now is the time for us to focus our minds on concrete action to prevent the 68 million girls at risk from being cut (between 2015-2030). To actively construct the enabling environment to support more girls like Ndèye to become filmmakers, astronauts, Presidents… indeed whatever they want to be. We can all create a future free from the shadow of FGC, and its many potential health, social and economic consequences. My CSW ended with a small gathering of fellow civil society partners, survivors and activists working on FGC to think about opportunities to work together to achieve the Agenda 2030 goal to end the practice. Civil society can be the bridge between girls like Ndèye and the national and international actors who are responsible for protecting her. Working from the bottom up – partnering with communities to enable them to abandon FGC at the grassroots through dialogue which recognises FGC as a social norm. This is a necessary partner to top-down legislative approaches governed by our international human rights and national legal frameworks. Between us we do have the answers to ending FGC. And girls like Ndèye – their voices and stories – are helping to highlight a path to total abandonment. This blog was written by Orchid Project’s Head of Advocacy & Policy, Ebony Riddell Bamber. Listen now to Ebony speaking from CSW 2019 on BBC Woman’s Hour. Feature image credit: Ebony Riddell Bamber, Orchid Project.